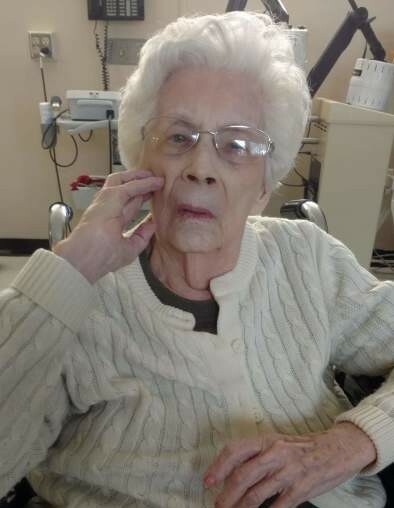 Clara Belle Newkirk, a 92 year old former Trenton, MO resident, passed away at 1:21 p.m., Tuesday, April 02, 2019 at North Kansas City Hospital in Kansas City, MO. Funeral services are scheduled for 10:00 a.m., Saturday, April 6, 2019 at Resthaven Mortuary of Trenton. A private burial will be later in Resthaven Memorial Gardens of Trenton. Memorial donations may be made to the Green Hills Animal Shelter and may be left with or mailed to the funeral home. Clara Belle Newkirk was born October 29, 1926 in Spickard, MO to Otto F. and Clara Hortence (Fears) McCloud. Clara Bell worked for Equifax Services in Kansas City for 13 years. On July 25, 1943 she was united in marriage to Edward L. Newkirk in Trenton. They were members of the 39th St. Church of Christ in Independence, MO. Surviving relatives include her daughter Marice Norris of Blue Summit, MO, brothers Randall McCloud of Trenton, Clarence McCloud of Beeville, TX, Mike McCloud of Trinity, TX, and Robert McCloud of Independence, MO, grandchildren William E. “Bill” Norris of Overland Park, KS, and Rebecca “Becky” Kaster and husband Buz of Kansas City, KS, six grandchildren, Thomas, Brandon, Isabella, DeAnn, Christal and Angie and nine great grandchildren. Those preceding her in death include her parents, husband, sister Vina Lee Spickard, Brother Glen Dale McCloud, and infant children Gerald Lee and Sandra Kay.